Recent Updates on the Phytochemistry, Pharmacological, and Toxicological Activities of Zingiber zerumbet (L.) Roscoe ex Sm. Background: Zingiber zerumbet (L.) Roscoe ex Sm. (family, Zingiberaceae) is a potent medicinal herb widely known as shampoo ginger and its rhizome is used in numerous ethnomedicinal applications including antipyretic, anti-inflammatory, antibacterial, anti-diarrheal, antidiabetics, carminative, and diuretic. The aim of this review was to bring together all the scientific updates on the phytochemistry and pharmacological activities of this herb, including their toxicological studies, and critically analyzed the outcomes to provide directions for future research on the herb as potential source of bioactive metabolites for pharmaceutical and nutraceutical applications. Methods: A structured electronic search on worldwide accepted scientific databases (Web of Science, PubMed, Google Scholar, Science Direct, SciFinder, Wiley Online Library) was carried out to compile the relevant information. Some information was obtained from books and database on medicinal plants used in various countries. Results: About 60 metabolites, mainly polyphenols, and terpenoids have been isolated and identified. However, most of the reported pharmacological studies were based on crude extracts, and only a few of those isolated metabolites, particularly zerumbone have been investigated for biological and pharmacological activities. Many of the mechanistic studies to understand the pharmacological effects of the plant are limited by many considerations with regard to design, experimentation and interpretation. Conclusion: The bioactive metabolites should be further investigated on their safety and more elaborate preclinical studies before clinical trials can be undertaken. Keywords: Pharmacological effects, phytochemicals, rhizome, toxicological effects, zerumbone, Zingiber zerumbet. Title:Recent Updates on the Phytochemistry, Pharmacological, and Toxicological Activities of Zingiber zerumbet (L.) Roscoe ex Sm. Keywords:Pharmacological effects, phytochemicals, rhizome, toxicological effects, zerumbone, Zingiber zerumbet. Abstract:Background: Zingiber zerumbet (L.) Roscoe ex Sm. (family, Zingiberaceae) is a potent medicinal herb widely known as shampoo ginger and its rhizome is used in numerous ethnomedicinal applications including antipyretic, anti-inflammatory, antibacterial, anti-diarrheal, antidiabetics, carminative, and diuretic. 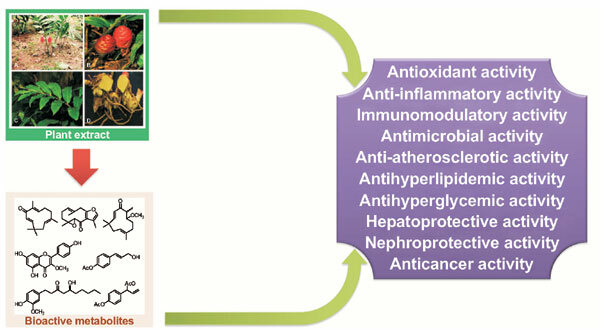 The aim of this review was to bring together all the scientific updates on the phytochemistry and pharmacological activities of this herb, including their toxicological studies, and critically analyzed the outcomes to provide directions for future research on the herb as potential source of bioactive metabolites for pharmaceutical and nutraceutical applications.